CSLR Francisco de Vitoria Senior Fellow Rafael Domingo received an honorary doctorate from Saint Ignatius of Loyola University. Past recipients of the honor include Mario Vargas Llosa, winner of the 2010 Nobel Prize in Literature, and José María Aznar, former president of Spain, among others. 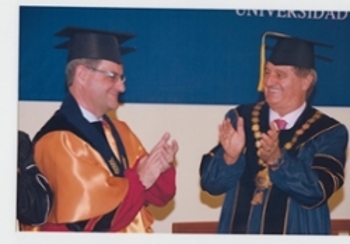 Domingo also received an honorary diploma from the Peruvian Congress for his contributions to law and legal science. He was inducted into the Inter-Academy of International and Comparative Law at the Palace of the Peruvian Bar Association, and National University of Saint Mark awarded him the Jose Barandiaran Medal of Honor. While in Peru, Domingo lectured on religious freedom and secularism in the Pontifical School of Theology and on global law and judicial power at the Peruvian Supreme Court. He met with Keiko Fujimori, the Peruvian presidential candidate. A specialist in legal history, legal theory, ancient Roman law, and comparative law, Domingo has published more than 15 books and 50 articles. Domingo’s writings have appeared in English, Spanish, French, German, Japanese, Russian, and Italian, and he has delivered dozens of public lectures throughout North America, Europe, Latin America, and Japan. Recent books include The New Global Law (Cambridge University Press, 2010) and God and the Legal System (Cambridge University Press, forthcoming in June 2016). Domingo arrived at Emory Law in 2013 from University of Navarra School of Law in Spain, where he was a professor of law, a research professor, and dean. He is a frequent CNNEspanol guest, commenting on issues related to Catholicism and Pope Francis.